These wheels have been accurately drawn using CAD technology and the masters were 3D printed. 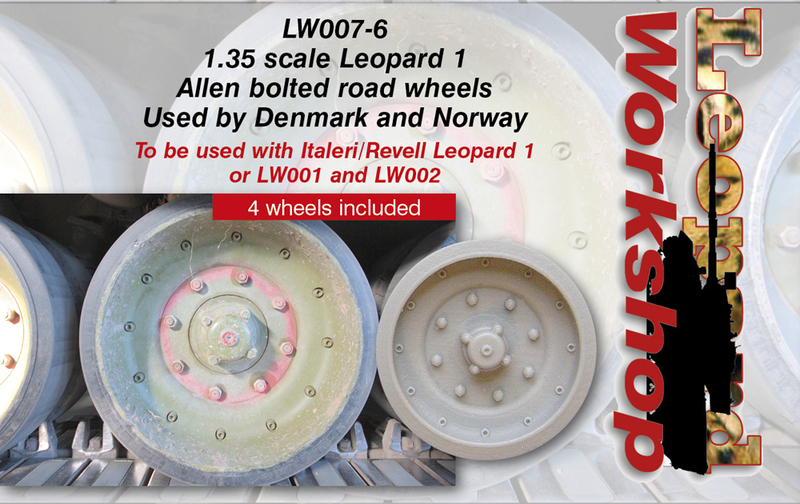 To be used with Italeri/Revell Leopard 1 or LW001-1 or LW002. The front faces only are included. Ideally these bolted wheels should be used with LW001-1 or LW002. They are all the correct profile, unlike other kit wheels. When used together, they will work. They are also designed to be used on new Leopard Workshop swing arms which will be released in December 2014. These wheels cannot be used with the Meng or Takom back road wheel faces. Both the Meng and Takom back road wheel faces have a compeltely flat profile which depend on a molded-on spacer on the front wheel face. These should be replaced altogether. In use (1:1 scale), these wheels were mixed with the original wheels. It is very rare to find a tank equipped with a complete set of these bolted wheels. 'Type 5' and 'Type 6' are the most common in use, 'Type 3' the least common. The 'Type' numbers are Leopard Workshop numbers, not official type numbers! For more information, please have a look at the review of this product by Kenneth Østergaard.